Collette’s character is a mess, and it was established that she had been a mess for many years. But the tipping point she goes into is a revelation of performance… there were so many tics and challenges of her psyche that I’m surprised TC stayed sane. This is a classic horror film that has echoes of “Rosemary’s Baby,” but goes into another one-of-a-kind and sinister direction. The supporting cast – Gabriel Byrne, Alex Wolff, Ann Dowd and intense young newcomer Milly Shapiro are so reactive to Collette’s cues that the ensemble seems of one mind. This is the first feature film for writer/director Ari Aster, and it is a legend, to be compartmentalized and analyzed for many years to come. 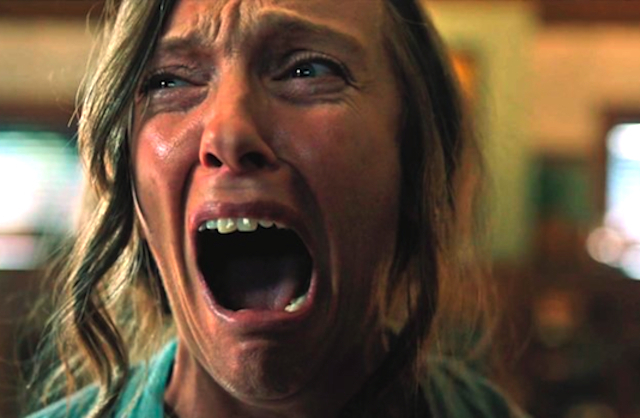 The elderly mother of Annie (Toni Collette) has just died, and her family of husband Steve (Gabriel Byrne), son Peter (Alex Wolff) and daughter Charlie (Milly Shapiro) goes to her funeral without a sense of closure. Annie is an artist who specializes in miniature scene recreations, but as the stress of a new exhibit starts to weigh on her head, she begins to see visions of her dead mother. Charlie is a hopeless outsider, rejected by her 13 year old peers. Annie attempts to have her assimilate by forcing older brother Peter to take his sister to a party. Left to her own devices at the event, she eats something that runs counter to her peanut allergy, and when Peter is told, it becomes a race to see if he can get her to emergency. The result of that incident throws everything into a tailspin, and long-buried secrets emerge. And boy, are those secrets gripping, as in you’ll be “white-knuckling” your seat. It mostly has to do with the supernatural, and the attempt by mortal man to control it. When an unreasonable old lady – Annie’s mother – looms as a larger and most devastating figure as the story goes on, it is Annie who takes the brunt of it. The disease in her family tree is beginning to rot her inner sense of self, and she becomes possessed and obsessed with the trappings of whatever she cannot explain. One of the more underrated character actors of the last ten years has been Ann Dowd, who appears in “Hereditary” as a benign grief counselor named Joan, who of course becomes something more. Dowd is memorable again, as she plucks away at the family like vulture on a corpse. 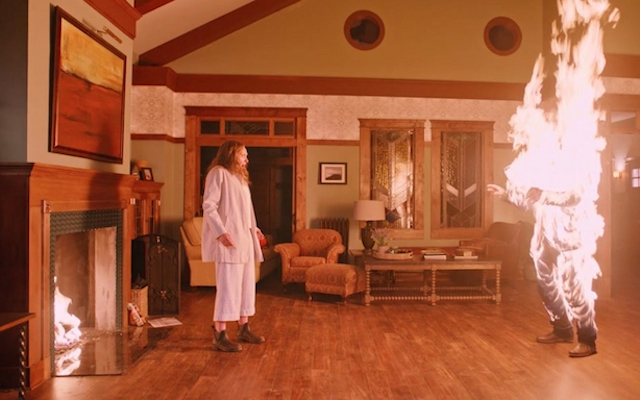 Pair that creepiness with Milly Shapiro’s Charlie – who has a habit of clucking her tongue – along with Gabriel Byrne’s Steve, who in his low keyed “normalcy” could be the oddest character of the bunch, and you have a complete recipe of ongoing developments. The MVP supporting character, who has to play off of his sister’s contrariness, is the great young actor Alex Wolff (“Patriots Day”). With his distinct look and ability to project an inner turmoil, he goes through a hundred trials, all bearing down as a result of a horrific mistake. His journey becomes most key in the story, as the volume is turned to eleven with story repercussions in the last 45 minutes. This is collapsing time, as the narrative layers start to pancake like a tower falling into itself. Make sure your bathroom needs are fulfilled for this section of the film. Woo-hoo, this is summer horror that has nothing to do with a beach body that should remain unrevealed. It’s a wonder to have yet another voice in the movie wilderness who cries out in the thicket, leading to a reformation of dark and darker. Good Morning Black Hole.